New York Mets relief pitcher David Aardsma (30) pitches against the Pittsburgh Pirates during the sixth inning at PNC Park. The Pittsburgh Pirates won 4-2. CLEVELAND – The Indians are bringing pitcher David Aardsma into the fold, signing him to a minor league contract with a non-roster invitation to major league spring training camp. The 32-year-old righty reliever spent most of the 2013 season with the New York Mets, going 2-2 with a 4.31 ERA in 43 appearances. Aardsma finished the campaign on a high note, giving up only one run in his final nine outings. He was brought in by the Mets in May after spending spring training with the New York Yankees and a month in the Miami Marlins organization. Aardsma was the Mariners’ closer in 2009 and 2010, notching 69 saves, before missing most of 2011 and 2012 following surgeries on his right hip and elbow. 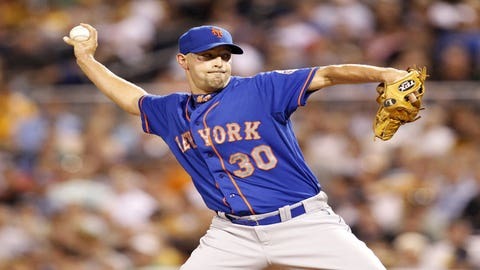 The veteran has a 4.23 ERA in 298 relief appearances since beginning his career with the San Francisco Giants in 2004. Aardsma has also pitched for the Boston Red Sox, Chicago Cubs and Chicago White Sox.